-I did not study Latin in secondary school. The inflections and all the other stuff was too much to cram into my head at the time, it was just not worth it. -The text is very ugly Latin. Not the classical pure stuff you would find in text books or dictionaries. They sure made some stuff up as they went along. -So I tried the easy way out. But there is no online latin translator to help me out. None whatsoever. Zilch, nada, bupkis, zero, niente, didly-squat, nix. Even if it were a very bad one I'd be fine with that. I get the gist of the text when skimming it, but once I get started on single sentences, I get bogged down. While still hoping to find an online translation tool I ran into several sites but none did what I had expected them to do. Pig Latin? I was aware of something called Dog Latin, the Private Eye sometimes has a section devoted to mock honorary degrees. But had never heard of Pig Latin. I must be getting on, out of touch. Not down with the kids anymore. Otnay ownday ithway ethay idskay anymoreway. 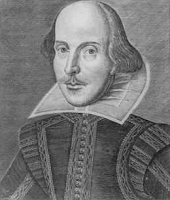 It's William Shakespeare's facebook page. NIN is currently on tour. Their tour website is up. 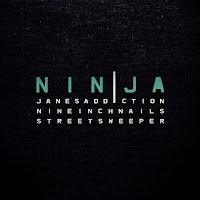 If you register you can download previously unreleased material from Nine Inch Nails, Jane's Addiction and Street Sweeper. If you liked The Slip, you'll like this too. If you ever go to Chartres and visit the beautiful cathedral, make sure you also look at the wonderful portals. Take your binoculars with you to see every detail. 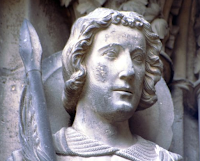 I'm taking a course on gothic art, the professor was talking about the difference in styles between two portals and was pointing out an evolution in the way statues were being used and why they looking the way they look mid thirteenth century. And then he pushed the button on his computer to put the next slide up. 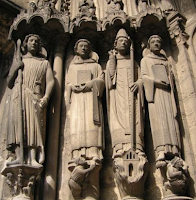 It was an image of the Porch of the Martyrs (the left doorway on the south transept). 'Don't you think that statue looks exactly like a young Richard Gere? That statue is a dead ringer for how he looked from the time he starred in American Gigolo'. Throughout the rest of the lecture he kept referring to it as Richard Gere instead of Saint Theodore. These scolars say the darnest things due to lack of sleep. Yesterday my Professor of Philosophy pointed out that according to Hegel 1 + (-1) equals not zero but Napoleon. I thought that was quite funny, I wonder if Napoleon would have liked the comparison. 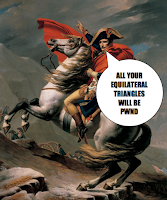 I am referring to the little known fact Napoleon himself was a brilliant mathematician. Here's more exciting math if you can't get enough. My post about this on the ILS forums caused a bit of a stir. I thought this was funny but most people couldn't see anything funny about a plane crashing into a graveyard. 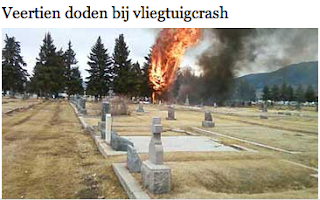 "Reports have come in that a two seater plane has crashed on a cemetery, so far as much as fourteen bodies have been recovered, aid workers are expecting many more"
So just to be clear on this, I don't think crashing planes are casually funny, but the caption and photo are if you think about the joke as mentioned. Tuesday's prediction: 24º and thunder, around freezing point at night. 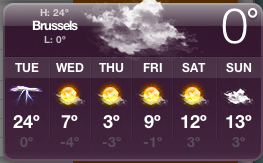 I'll have to re-arrange the clothes in my cupboard so I can reach woolly jumpers and my bikini. Nearly 800 years ago our ancestors started building the Sint-Rombouts Cathedral tower in Mechelen and they're still adding bits today. A glass walk way is being added so all lovers of high and old things can peruse around at 100 meters above street level. Louis XV, Napoleon Bonaparte and King Albert I all had to do without such a contraption. 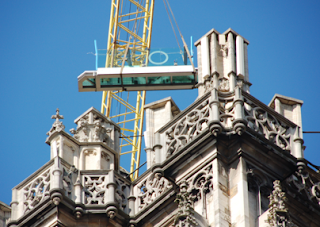 I wonder how long it will take before the first base jumper gives it a go.